NICE, ALPS MARITIMES/FRANCE - APRIL 29, 2015: Unidentified people eat at restaurant at Cours Salaya, Old Town. It is the most traditional square of the town, with its daily flower market. 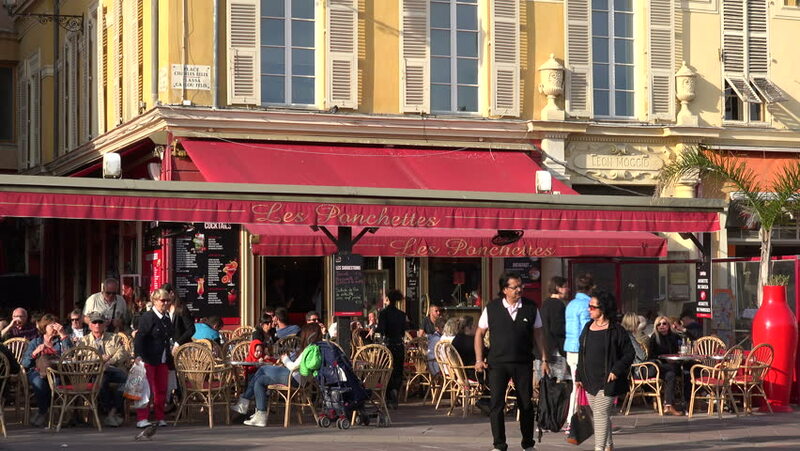 4k00:11NICE, ALPS MARITIMES/FRANCE - APRIL 29, 2015: Unidentified people visit restaurants at Cours Salaya in the Old Town. It is the most traditional square of the town, with its daily flower market. hd00:20BHAKTAPUR, NEPAL, CIRCA MAY 2014 - Tourists and locals walk by the Caf\xE9 Nyatapola at Taumadhi Square circa May 2014 in Bhaktapur, Nepal. Bhaktapur is listed as a World Heritage Site by UNESCO. hd00:32SHANGHAI - CIRCA AUGUST, 2011: Pedestrians walking on sidewalk.